Danny Care is ready to get stuck in to England's Six Nations bid and insists that the squad has what it takes to right the wrongs of their stuttering November campaign. The Harlequins scrum-half played in England's defeats to Australia and New Zealand and also their narrow win over Argentina and understands the growing pressure for the squad to perform. But the 23-year-old is confident the side can return to winning ways and has complete faith in the under-fire backroom staff, headed by Martin Johnson. "When you play for England you're expected to win and when you don't, questions are going to be asked, rightly so," Care told ESPNscrum. "Everyone expects England to be up there with the best teams in the world and that's the aim, that's where we want to get to again. Hopefully we'll go into the Six Nations full of confidence and with a clean slate, and we want to go out there and win it. "There's a great mix between the attacking coaches and defence coaches. Brian Smith is full of attacking ideas and wants to play with an attacking scrum-half and that hopefully suits me. It's great to work with him. 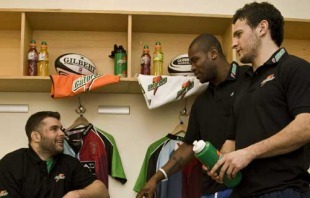 Martin Johnson is a great guy to have around the squad with the amount of experience he's got. He's a great guy to talk to." England have been boosted by the return of a number of high-profile players from injury ahead of their opening game against Wales on February 6, with Riki Flutey, Delon Armiatge and Care's Harlequins team-mate Nick Easter all back in action. "Nick Easter is probably one of the most experienced players in the squad," Care said. "It's great to have him around. He's kind of my go to guy at Quins. If we're in a bit of trouble I can give him the ball and he'll get us on the front foot. He's the same for England, a great leader and a great guy to have back in the squad." Wales face a host of injury worries themselves ahead of kick-off, notably in Care's position. Mike Phillips and Dwayne Peel are out with injuries, leaving the inexperienced Richie Rees and Martin Roberts alongside Gareth Cooper as their options. "I think I've played against all of their scrum-halves, three great scrum-halves," Care said. "Any team you play in the Six Nations you're going to be coming up against a good player in your position, I'll be looking forward to those battles. "Any team can beat anyone on their day; it's going to be a very tight competition. We'd love to win it, but we'll just take each game as it comes, starting with Wales. It's a massive game for both countries, both had frustrating autumns and want to go into that game and win it." Care's other battle will be against London Irish's Paul Hodgson and Leicester's Harry Ellis for a slot behind the scrum. Care and Hodgson shared the shirt during November in Ellis' absence and the Quins man is excited about resuming a friendly rivalry. "It's fantastic competition all over really, Paul Hodgson and Harry Ellis in the main squad and the other lads in the Saxons squad," he said. "The best should play and it's great to have that level of competition because you can never rest on your laurels and every game you have to go out there and perform. "I just can't wait to get out there and play. It would be fantastic to be in that squad for the first game against Wales, that's my aim, I've just got to play well for Quins and hopefully get picked." To get involved in Gatorade Gives Back, simply collect codes shown on each bottle of Gatorade and enter them via mobile or online through www.gatorade.co.uk to accumulate points on an individual basis for prizes or as a team for monetary rewards.